TIP 1: Place one drop under your tongue and then swallow a small amount of water to help wash the oil down to help you fight the cold and flu bugs you may come in contact with when you are out and about. TIP 2: With your babies and your young children, rub Thieves on the bottom of their feet to protect them from the yuckies they encounter when they head off to daycare and preschool! TIP 3: Fill a spray (glass) bottle with water and then add Thieves to use to clean counter tops, sinks and toilets. TIP 4: Put one drops on a q-tip then touch the q-tip to your canker sore to numb and speed up the healing process. TIP 5: Apply a single drop onto your toothbrush to sanitize it and to help your teeth fight bacterial in your mouth! BONUS TIP: Put a drop on your little finger, let it dry and then carefully rub your finger on your baby's swollen gums when teething to help with teething pain. The clove oil (which is in Thieves) has been traditionally used to help numb sores in the mouth. 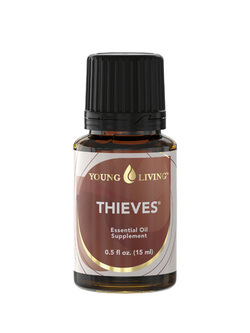 PROPERTIES of Thieves include: analgesic, anesthetic, anti-aging, antiviral, antibacterial, anti-fungal, anti-infectious, anti-inflammatory, antioxidant, anti-parasitic, anti-toxic, anti-tumoral.